You can buy new, used or even cut down and re-grip Dad's old set of metal shafted golf clubs for your children. Usually, when kids first take up golf, they are relegated to clubs that are less than ideal: too long, too heavy and just not made for a child. While you want to make sure your 6- to 12-year-old child has a real interest in the game before spending money on clubs, you don't want to wait too long, as improperly fitted clubs can affect her swing for years to come. 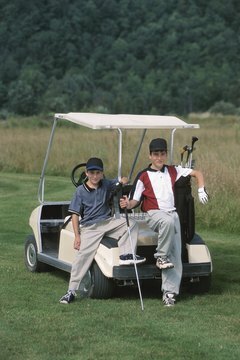 Junior golf clubs are usually sold with a corresponding age range. While there really isn't much variation in size, it's important to get a set that corresponds to the child's size and athletic ability. For a child who is 4 feet tall, Clubmaker.Net recommends a 33-inch-long driver, a 28.5-inch 5-iron and a 27-inch 9-iron. You can buy a one-size-fits-all set and have your child choke down on the clubs if they are too long, or you can get custom-fit clubs at a golf store or pro shop, which will be more costly. When a child is first starting out, he doesn't need a lot of clubs. Golf pros and golf shops who specialize in outfitting clubs recommend a child carry five clubs: a fairway wood that can also be used off the tee, 5- and 7-irons, a pitching wedge and a putter. While children don't yet have much strength, if the clubs you purchase are light in weight, they'll be able to hit the ball farther and play for a longer period of time. Look for a lighter bag as well so she can carry her clubs, and make it easier for you to carry if she needs a break.